You Never Can Tell is a real Rock N Roll classic by Chuck Berry, giving you a taste of Chuck Berry’s style of music. The original song has of course has a full band playing, so the guitar part on it’s own isn’t that exciting, but you can really grove out if you play it along with the original or a backing track. Our You Never Can Tell guitar lesson will teach you to play the intro (which is probably the most difficult part of this otherwise pretty easy song), the chord progression during the verse, and of course, that catchy “solo” played by the pianist, which also sounds great on guitar. Don’t use much overdrive, you’re aiming for a cleaner, punchy sound. If you have digital effects, adding a compressor will boost the punchy sound. All right, so let’s have a look at the intro to You Never Can Tell. We’ll be playing 6ths along the high E string, which is very common in lots of songs, and then we’ll have a few strums at 2 chord fragments. Now the intro is pretty tough, you’ll want to spend some time getting it perfected slowly at first, and speeding up as you can. It might take weeks to get it up to speed, but don’t worry, just progress at your own pace. The original song is played at 159 BPM, which makes pretty fast. In the next section of our video tutorial on You Never Can Tell, we’ll go through the verse chord progression, which is actually made up of just 2 power chords. You’ll be strumming 8th notes with a straight rhythm used in Rock n Roll, as opposed to the swing rhythm used often in blues. Download the You Never Can Tell tablature file to see the exact order of chords for the verse. Lastly, we’ll learn the solo which the piano plays in the original recording. 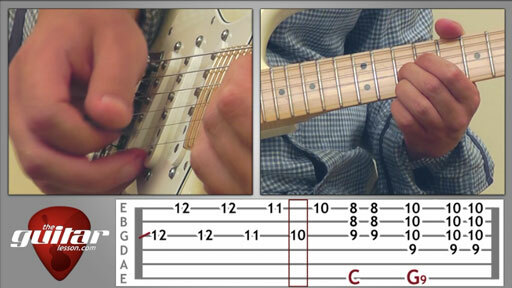 It’s a nice easy solo that you’ll be able to learn very quickly, many parts of it are very similar. You Never Can Tell (aka C'est La Vie) rock and roll song by Chuck Berry, originally released in 1964, and made super famous again in Pulp Fiction in 1994. The song’s story is very simple, it basically talks about the wedding and life of a young married couple in 4 verses. Nice and simple, what else would you need?! Sorry, but you've reached a premium content area. The download of the You Never Can Tell tablature file is only available to premium members. Sorry, the same goes for the backing track. To download the backing track to You Never Can Tell, please log in and revisit this page.